I have used this technique to create the card below. This was inspired by a quilt cover design I have seen recently. Inspiration is truly around us if we take the time to look/listen. 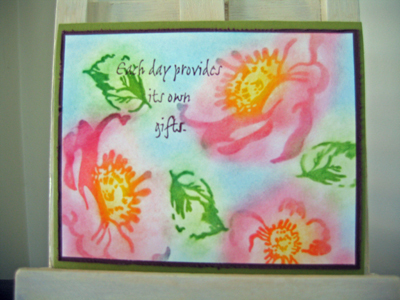 2) Use sponge daubers or stamping sponges to apply pastel colour directly to ink. 3) Blow off any excess powder. If you are using a 2-step stamp set, repeat this process. You can set the pastels using a cheap aerosol hairspray, but this is not advisable for using on a scrapbook layout as it may be unsafe for your photos. If you do use hairspray on your cards (personally I don’t), remember to hold the can approximately 30cm (12 inches) away from your project. gorgeous card – what a great way to use this technique.